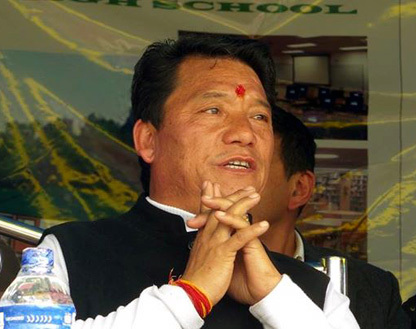 Gorkha Janmukti Morcha (GJM) President Bimal Gurung on Saturday said he and several others named in the CBI charge sheet in connection with the murder of All India Gorkha League leader Madan Tamang were innocent. "Me, wife Asha, party MLA Harkabahadur Chettri and all others in the Morcha are innocent and we are victims of a conspiracy," Gurung told a hastily-called press conference here. The GJM leader, who however refrained from elaborating on the conspiracy, said, "We have faith in the judicial system and let the truth come out about the murder." The press meet was also attended by other Morcha leaders. Gurung's comments come after CBI on Friday filed the final supplementary charge sheet in the District and Session Court Kolkata against him levelling charges of murder and criminal conspiracy for the killing of Madan Tamang. The charge sheet also named Asha, GJM MLA from Kalimpong, Harkabahadur Chettri, Assistant General Secretary of GJM, Binoy Tamang, GTA Chairman Pradeep Pradhan, deputy chief executive of GTA Col Ramesh Allay and 16 others for criminal conspiracy, murder and other charges. Prime accused in the case, Nickol Tamang had, however, disappeared mysteriously from Pintail village near Siliguri, where he was being held by state CID, on August 21, 2010 for interrogation following his arrest. Pema Tamang, wife of Nickol Tamang, had moved a habeas corpus before the Calcutta High Court saying that her husband be traced. The High Court had then directed the CBI to take up the Madan Tamang murder case and the Nickol Tamang disappearance case. Madan Tamang had been hacked to death at Upper Clubside in the heart of Darjeeling town on May 21, 2010 when he was overseeing preparations for a public meeting.